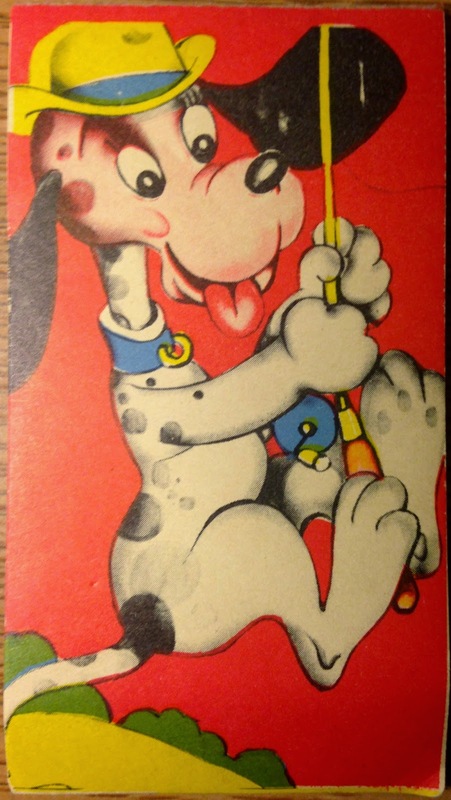 Here's the cover of a tiny notepad that we came across while sorting through some stuff at my mom's house. The notepad measures just 2⅛ inches by 4 inches. There is no indication anywhere of the publisher or manufacturer. The illustration features a dippy dog who is apparently being lifted into the air by something he caught with his rod and reel (though I hesitate to read too much into the picture). The fact that we can't see everything that's happening makes me think this might have been part of a set of small notepads. Putting them side-by-side might have revealed the full cartoon. But that's just a guess. A Google "reverse search" for this particular image did not yield any results.